Since the Chinese Shar-Pei is a loyal family dog, they take some time to get acquainted with their new family. Most of them do not bond instantly. We would like to advise you to keep the dog home to get acquainted with it for a period of three days at least. We would recommend that you not take them to a pet store, park, and more especially a dog park until you know that the dog has bonded with your family, and will come back to you should they get loose. We would like to caution you about using a buckle collar on a Shar-Pei. We highly recommend that you use a choke chain or choke collar made of cloth when you are taking them outside on a leash. The reason for this is because a buckle collar can come right off the dog’s head if they decide to lunge for something, and you are left holding the leash and collar but not the dog. And almost any Shar?Pei that is not on a leash will run from you. Especially a dog that is new to your home. They will run and ran fast. From lots of years of experience, we can tell you that they are almost impossible to catch when they are running loose. There is some danger from wearing a choke collar on a dog. The loose end of the collar can get caught on something, and if the dog falls or jumped etc., it can choke or strangle the dog. To prevent this or lessen the danger, it is important that you only have about 2″ of loose collar when you attach a leash to it. That is the perfect size if it fits the dog like that. If your dog is a little bit unruly on a leash, you will get better control with a metal choke chain. If your dog is good walking on a leash, then a cloth choke chain will work fine. You get a little bit better control with a metal choke collar. Please do not be swayed to get a buckle collar at the pet store, no matter how convincing the store employee is. We have had years of experience with Shar-Pei, and a store employee is just that, an employee. They do not have nearly the knowledge that we have. Please be extra caution when opening doors to the outside until you know your dog. They can be out the front door in a second, and then you have a dog running on the loose, which will be extremely hard to catch. Extra caution should be used when the dog first comes to your home. Since Shar-Pei are very much family dogs, for the first few days, they will be wanting to return to their previous family in any way that they can. They will adapt to your family, and you will be their new family, but it takes some time for that to happen. I just a few days, they will be just as loyal to you, but in the mean time you must use extra caution. Although you might be tempted to show your new dog off at the pet store etc., we ask that you wait until the dog has accepted you as their family to avoid any potential trouble. There is a correct way to put a choke collar on a dog. You want to ring that you attach the leash to, to be on top. So if you are standing over the dogs back, and facing the same direction as the dog, the part of the collar that you attach the collar to, should be on top and headed in to the right side of the dog. This allows the collar to loosen up when the dog isn’t pulling. If you put the collar on backwards, it will not loosen up as easily, and the collar will keep tension on it. You do not want that to happen. Dogs do not like tension on the collar. The tension is the signal that they need to straighten up. If there is constant tension on the collar, the dog has no idea when he is doing bad or good. 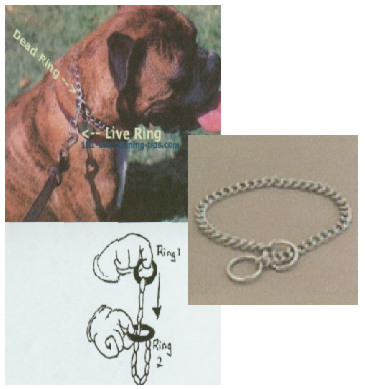 When putting the collar on, the part of the chain connected to the live ring (the ring the leash is connected to) should be on top of the dog’s neck. With the collar put on this way as soon as the leash is made loose the collar releases or relaxes. After you know your dog, and he knows you, you might want to take the collar off and only use it when you are going on a walk. But we recommend that you keep the collar on for a few days, so that, if by any chance, the dog does get loose, you have something to grab him by.